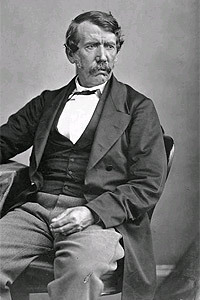 19 March, 1813: Birth of David Livingstone (d.1 May 1873). David Livingstone was born in Blantyre, Scotland on March 19, 1813. The son of poor parents he was the first white man to cross Africa with the Gospel of Christ. His accomplishments were incalculable: traveller, zoologist, philanthropist, linguist, author, geographer, mercantile director, physician, theologian, explorer, astronomer, missionary, teacher, evangelist and emancipator.